Elegance is a key feature of every room of the Parador. The stately function rooms, spacious guest rooms with sea views and spectacular stone staircase that welcomes you at the entrance are just a few examples of the majesty of this medieval fortress. The Parador de Baiona offers perfect function rooms for your celebrations, with space for up to 400 people. An intimate ambiance, exquisite decor, well-kept gardens and an idyllic landscape make this a truly unique spot. The Hotel América has a clear commitment to quality. 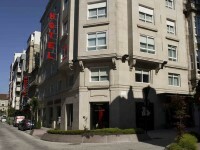 Our hotel is located in downtown Vigo, in an exceptional setting in the financial district of the port. Nestled between Plaza Compostela and Maritime Station, the Cíes Islands ferry and the old town are just a stone’s throw away. 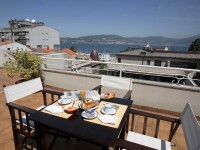 Easy access to the main transport links, port and airport, as well as the attractive beaches of the Ria de Vigo. The Café on the seventh floor has stunning views of the Ria, ideal for cocktails. This hotel is located in Redondela near the Camino trail. 10 rooms overlooking the Umia River and our gardens, in which we have taken care to make you experience the most romantic Galician essence. There is also a hairdryer, LCD television, wi-fi access, laundry service and if you want, you can have breakfast in the room. Just a floor away from your room, our staff has prepared a menu so that all of your senses will be in harmony. If you’re in the Salnés area, you must try the local cuisine. Savor our cuisine based on local produce and market cooking. Let us make your stay an unforgettable experience in our breakfast room, a spacious lounge featuring a chimney and numerous interior and exterior spaces. Enjoy the river from our wooden bridge and our house’s viewpoint. Nature, design, personalized service and the water bubbling in the background. This emblematic 16th-century building, a recreational mansion that used to belong to Compostela’s archbishops, was erected on a walled plot of land measuring 50,000 m2 with woodland and gardens. It is only 300 metres from the historic town of Padrón, where the Nobel Prize-winner Camilo José Cela was born and the last residence of the great Galician writer Rosalía de Castro. There are 27 rooms, divided between the historical 16th-century and modern 20th-century buildings. Plus, there is an outdoor swimming pool and free WiFi.